Bob Jo's on Fort Street in Wyandotte isn't much to look at, but the line of people outside tells you all that you need to know. This place is simple and good. The sign says "Established 1947" and I doubt much has changed since then. 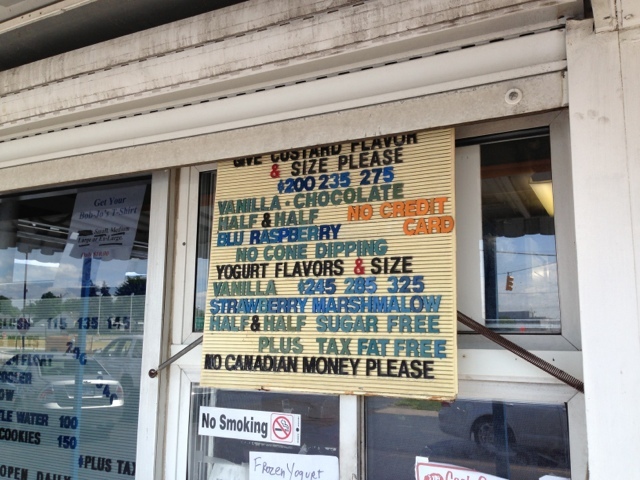 Bob Jo's has frozen yogurt, novelties, and blizzards, but you don't want that! You want the frozen custard! The texture is just so thick and dense, you can tell that this stuff is bad for you - but that's why it tastes so good. This is a soft-serve custard that always comes in Vanilla, Chocolate, and Half Vanilla - Half Chocolate. 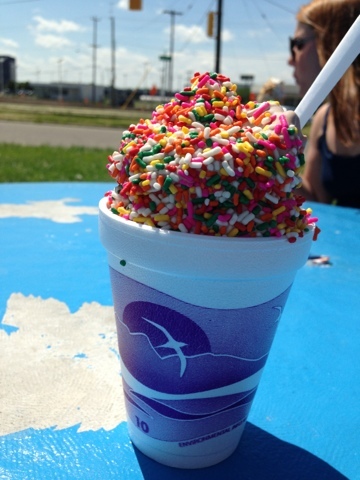 My usual favorite is Half and Half with either rainbow sprinkles, chocolate sprinkles, or toasted coconut on top. They have a rotating special flavor which changes about every week or so. 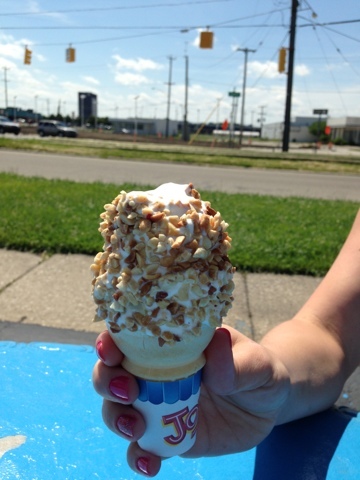 Everyone has their favorite special flavor, and mine is English Toffee or Creamsicle. On this particular trip, I got Half and Half with rainbow sprinkles. (Seriously the best sprinkles ever.) 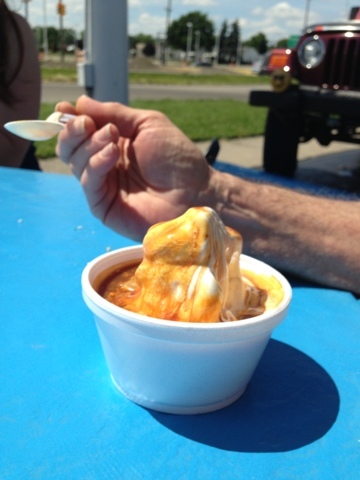 My Dad got a caramel Sunday with the vanilla custard. My sister got a Vanilla cone with peanuts. As we stood in line, we chatted with the other people. One man said that he drove all the way from Redford (about 30 minutes away!) in order to get this Sunday treat. He insisted that the recipe hadn't changed since he was young, and it is his absolute favorite. He drove that whole way just to get a small vanilla cone. The woman in front of us told us that her favorite flavor was Pistachio, which they had the previous week. 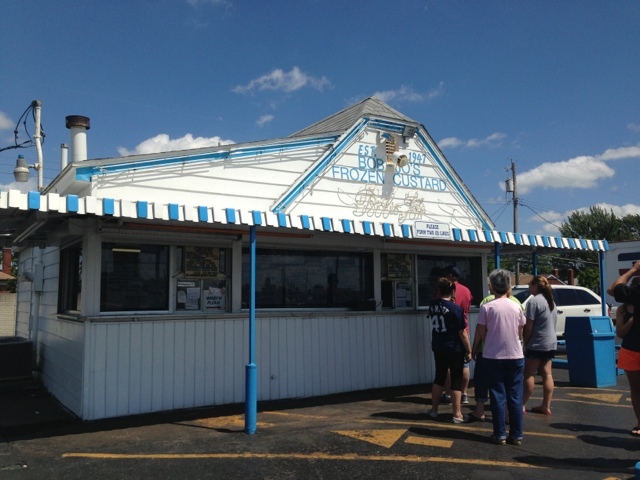 Like many ice cream stands in Michigan, Bob Jo's closes for the winter - which makes it even more important to get it while it's open! It is right in the middle of Downriver's Dream Cruise which is a classic car cruise on Fort Street. Expect to see classic cars stopping by on any Sunday. People enjoy cruising in their classic cars up to get an old-fashioned ice cream.